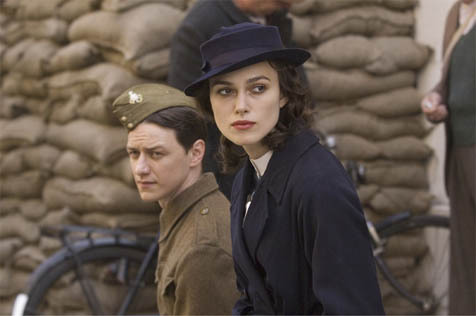 James McAvoy and Keira Knightley are ill-fated lovers in <em>Atonement</em>. Atonement is the film adaptation of Ian McEwan’s bestselling novel. Starring James McAvoy, Keira Knightley, and Vanessa Redgrave, it starts on a very hot day in 1935 when 13-year-old Briony sees her older sister, Cecilia (Knightley), take off her clothes and jump in the country house’s fountain in front of their housekeeper’s son (McAvoy). Briony’s version of what she saw that day will change the lives of all three. The young lovers will become victims of a child’s imagination, and Briony will commit a crime that will haunt her forever. Atonement is being hailed as an Oscar hopeful, and rightly so. 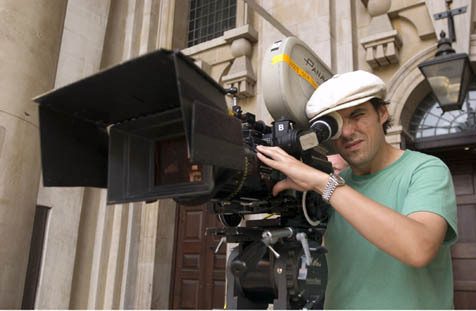 Directed by Joe Wright, who helmed 2005’s Pride & Prejudice, it is undeniably one of the best films of the year. I sat with the director last month to discuss his latest adaptation. This is your second movie in a row based on a famous novel. What is it about adaptations that you find so attractive? I like the limitations they present you with. I like limitations. I think limitations allow me to springboard, to challenge my images. Can you elaborate on the notion of limitations? You’ve got to stick to the story-and especially with such an extraordinary book. And so I didn’t want to change the book. When writers say, “There comes a point in adaptations when you have to throw away the book,” I never understood why. So with this, we decided not to throw away the book ever and to keep it very close to us, and we are very grateful for the novels. So when working on the adaptation with the screenwriter Christopher Hampton, we were really invested in the material and seeing how and where we could see a cinematic equivalence to the prose and structure and style of storytelling found in the book. I find I like limitations in terms of the shooting of the film as well. Is that how the uninterrupted, five-minute-long take in the middle of the movie came about? That’s one of the most breathtaking moments in film this year. That comes out of limitations. We have this big scene that was originally written as a montage, but we only had a day to shoot it because we could only have the 4,000 extras for one day. So I was very worried about that, and if I tried to cover that scene in the montage, that would have probably been about 30 or 40 setups. And I was worried about the light in the middle of the day and it was going to ruin it because I wanted it to be magical and poetic. Then one day, I came in to the set and said to our director of photography, “Seamus [McGarvey], how do you feel about shooting at the beach with a single steadycam shot?” He went pale, and I thought that was quite funny, and I started spreading this rumor that we were going to shoot with one steadycam shot just to frighten people a little bit. And as jokes often do, it turned into something quite serious, and that’s what we did. We turned up at 6 a.m. and kind of walked it through and had plans of where the ships should be and the boats should be and where all the elements should be and I had a rough idea of the route of the camera. : The extras started turning up at 6 a.m., a big job for costume and the art department. We just started walking it through over and over again and we spoke to every soldier on that beach about what their motivation might be and about what their action might be. Keira Knightley’s become your muse. How’s it working with her? I just admire her so much. I think she’s a really extraordinary actress and quite an extraordinary human being. She’s 21 years old and that just blows my mind from the start. She throws herself into rehearsal and I think she’s very brave as well. It’s a character that’s not always likeable and I think so many young actors these days are terrified of being disliked at any given moment-in case the audience doesn’t come and pay their box-office money to see them again. Keira is not afraid of that. She puts her craft first. Maybe that’s because the whole stardom thing is something she came to at a very early age and never had to try for that. She’s really feeling like she wants to develop as an actress and have a laugh as well. We both share a sense of humor, and we’re both dyslexic as well. What was the challenge of casting Briony and having multiple actors play that character? I think we did one sensible thing there: We most times cast the middle actor, the star or whatever, and then try to find the kid who looks like them and also can act. So you cast Nicole Kidman and then try and find some kid who looks like her and can act. And we did the reverse; we went and found the kid first-Saoirse Ronan-so it didn’t matter what she looked like as long as she could act. All three actors look alike and have the same physical mannerisms. How did you achieve this? We rehearsed with all three actresses playing Briony together. And they would copy each other, and we did a lot of physical bits, but everything was set by Saoirse, and then Romola Garai and Vanessa Redgrave followed her. So we’d start with the child and then thought, “How does the child develop into the teenager and how does that person develop into the older person?” So you start with the kid. And Saoirse and I developed the way she walked, and the very precise nature of her physical movements. Atonement opens in Santa Barbara theaters this weekend.